Growth from trauma is possible as people discover their own resiliency after traumatic events. To understand how healthy post-traumatic growth happens, the relationship between trauma and its biological underpinnings must be explained. Using the nervous system as a lens, trauma is seen as a response in physiology rather than just a psychological phenomenon as it was in the past. This is important as it shifts the way we view trauma from being a way people cope —like how strong or weak they are— to instead being a disruption of their physiology. True resiliency comes from us actually feeling better in our bodies, having a reduction of trauma symptoms, as well as making constructive meaning from traumatic events. The primary function of our autonomic nervous system (ANS) is survival. The ANS responds to “perceived” threat with certain responses based on its assessment of that threat. Note that “perceived” is the critical word here as it is on the body level that this perception occurs; this is called neuroception. It is not connected to our cognitive assessment but instead is the body’s immediate assessment of threat, which may or may not match the reality of the situation. Peter Levine was one of the first people to make the connection between animals in the wild and their biological responses to trauma. He found that animals in the wild complete their biological responses and do not end up with persistent trauma symptoms like humans. Our threats now are not really saber tooth tigers, but more things that happen in relationships or in other modern situations—but the body still responds to these as threats. Additionally, our nervous system has an evolutionarily inherited negativity bias towards the assessment of threat, meaning it sees threat more often than is really there as a way to stay safe. We are so survival-oriented, that our brain can easily mistake a stick as a snake. Whether “real” or not, when the nervous system perceives a threat we will try to get out of the situation using fight, flight or freeze. If we are unable to fight or flee, these responses have the potential to get “stuck” in the body. If one’s neurobiology is stuck in fight/flight response, there is more possibility for anxiety or anger issues and achieving real rest can be difficult. If one is stuck in the freeze response, depressive disorders are more likely to arise as well as issues with procrastination, low energy, accessing feeling, or responding fully to life. These nervous system states of incomplete trauma or “stuckness” limit the range of behavior that one can express. Dr. Bessel Van Der Kolk, MD, of the Boston Trauma Center, says "Trauma is a disorder of being in the here-and-now.” This means that trauma can prevent individuals from experiencing the “here and now” —as they are perpetually locked into an old reaction, or dysregulation—that is NOT connected to the present moment. When we are dysregulated, only certain aspects of our nervous system are available—which will limit our range of responses. When we are regulated, we can respond in the moment to exactly what is happening—and we are actually responsive. In life, we need to connect with others, set boundaries, and get out of situations that are not good for us. It is our working nervous system that helps us have these natural and appropriate actions. In essence, the state of our nervous system will determine our range of behavior. In a nervous system that is working well, we have the most access to this wider range of behaviors. The beauty is that post-traumatic growth (PTG) is a possibility. PTG is about expanding beyond the trauma that has occurred—and expanding into more of who we are. Post-traumatic growth can leave an individual more free to focus on the meanings of life, and to being more present. PTG is more than a reduction of symptoms. Instead, PTG is about having a new positive perspective on life. © 2017 Ruby Jo Walker, all rights reserved. This means that when we are able to yield and receive—in being open—as well as having the ability to extend and be protective when we need to be, we thereby have more fullness and resiliency in our lives. I hope you join us this week for the training (July 13-15) where this will be further explored. 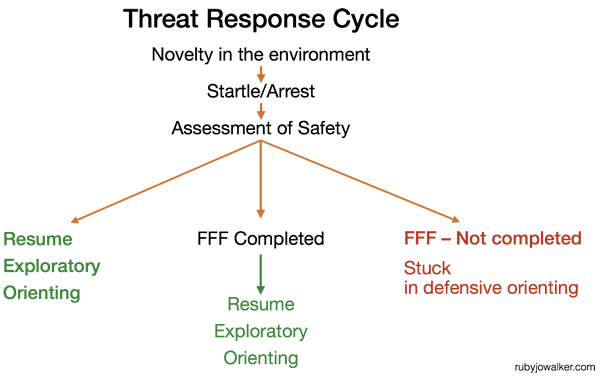 This diagram is the Threat Response Cycle that is part of our mammal experience. When there is any novelty in the environment, we try to locate it as a possible threat and assess it-- by turning towards it. This is how we “orient” to it. If we assess that there is no danger, we resume exploratory orienting—this means that we are in the present moment. If we assess that there IS danger, the body responds using our Fight, Flight or Freeze (FFF) systems. If we complete that response, we go back to exploratory orienting. If we prepare for one of these responses, and we do not get to execute them, the body stays stuck in “defensive orienting.” This means we are constantly trying to locate the threat. All of this occurs below the surface in our physiological responses. The power is that the physiology takes over and leads us into a narrative that is more about the state of our body, than reality. Trauma symptoms are connected to this aspect of physiology. The nervous system is always assessing the environment for threats. And because we are a survival-focused species, our nervous system will always be on the side of assuming it is danger. This is why we think it is a snake when we see the stick on a hike. So, there is this innate brilliance in our nervous system’s response that does not always work so well in our lives. Through many years of working as a clinician with clients who have experienced trauma, what I have learned and what is so clear to me now, is that studying the body is critical. Early on I found myself encouraging my clients to do body work as part of their therapy. As I continued to work with people, I had a hard time imagining that they could really feel better if their bodies remained in the same fear response. I could visually observe the enduring tension patterns in their bodies and they confirmed the existence of on-going tension and pain through descriptions of their experiences and suffering. This statement from Dr. Robert Scaer helped explain this phenomenon. Dr. Scaer is a neurologist who specialized in treating trauma, particularly with pain patients. His statement is referring to the idea that when the body prepares for a traumatic event through fight, flight and freeze (FFF)—this FFF response and preparation becomes permanently etched in our procedural memory (like how we never forget to ride a bike). It is actually stored in the same kind of memory file. So, yes, he is saying that this becomes permanently encoded in our tendons and muscles—and there are associated movements that the body also holds. There is a brilliance to this, really—in that we never want to forget how to respond, so these kind of memories encode differently in the body. The body does not ever want to forget this necessary survival response—and that is the brilliance—and it is also how people get stuck in trauma states, which are pain, anxiety, and depression as well as corresponding tension patterns. The body’s response to the threat is what keeps it “stuck.” One way to see this is that the body has a motor plan that it is trying to complete—and if it does, it begins to move more out of this state. This completion of a motor plan leads to where these trauma states are less of a draw for the body. Instead, we begin to create a different and settled state in the body. The next training will focus on helping clients heal from trauma by explaining how to identify these motor plans and how to bring these plans to completion. There will be videos, demos and discussion to help this be clearer for clinicians, body workers, medical personnel interested and those interested in studying trauma more. What does Diagnosis Mean in Trauma? In the post I will bring to light the ways in which ideas from these two visionaries overlap. To begin with, both of them refer to neurobiological states as being the underpinnings of any diagnosis. Diagnoses are categories that are descriptors, but diagnosis does not actually describe what is going on in the biology of the person that leads to the presentation. However, states of the autonomic nervous system do explain what is going on on the biological level that can lead to overall behaviors and patterns. First, let's look at regulation in the Autonomic Nervous System (ANS). A regulated nervous system is when we have a range of responses. Every moment is actually felt and experienced as new in this state. Dr. Bessel Van Der Kolk, MD, of the Boston Trauma Center, says "Trauma is a disorder of being in the here-and-now.” This means that trauma can prevent individuals from experiencing the here and now —as they are perpetually locked into an old reaction, or dysregulation—that is NOT connected to the present moment. When we are dysregulated, certain aspects of our nervous system are available or not—which will actually limit our range of responses. When we are regulated, we can respond in the moment to exactly what is happening—and we are actually responsive. This is not true the trauma state or any dysregulated state. As human beings we have the potential to get “stuck” in different nervous system states. If one is stuck in fight/flight response there is more possibility for anxiety or anger issues. If one is stuck in the freeze response depressive disorders are more likely to arise. These nervous system states of “stuckness” will limit the range of behavior for an individual—these are dysregulated states. In life, we need to connect, set boundaries, and get out of situations. It is our working nervous system that helps us have appropriate action. In summary, the state of our nervous system will determine our range of behavior. In a regulated nervous system state, we have the most access to a range of behaviors. That is the goal of working with people through a nervous system lens. Dr. Dan Siegel, MD, talks about chaos and rigidity. In chaos, he is referring to the fight/ flight system. In rigidity, he is talking about the freeze system, or "shut down". He talks about the idea that we are not responsive to life and situations--which is our human goal—rather than reactivity. Dr. Siegel is actually talking about the concept that chaos theory is what leads to trauma in the nervous system—the system is out of balance, not in homeostasis. This chaos actually is what keeps the system being disorganized—it cannot get back to being “ back to normal” again—or in homeostasis. Working with the nervous system directly can begin to help the system reorganize and go back into balance. This helps the person get out the chaos and rigidity. One of the things that is really interesting to me is the concept of Post-Traumatic Growth. It is an understudied area, and it develops the potential for individuals to expand their capacity for growth and learning. --Peter Levine, Founder of Somatic Experiencing. Increased sense of purpose. I often see people transitioning into more meaning for themselves in life. Their own deeper life path moves to the foreground in an important and impactful way. Greater appreciation of life. Gratitude comes as people become more present or more mindful in their lives. Seeing new possibilities. What can break us open can also open us more to life. Having increased intimacy in relationships. As we fully explore our trauma and discover our strengths, we do this alongside people who love and care about us; these relationships are often deepened through more authentic sharing and heart-felt communication. More spiritual. Many people develop a deeper sense of real and connected spirituality as they journey through trauma recovery. We will be exploring post-traumatic growth in the July workshop (two and a half days). I do hope you can join us. Look out for 3 more emails in the coming weeks that cover different topics to be addressed in the Integration of Trauma workshop. 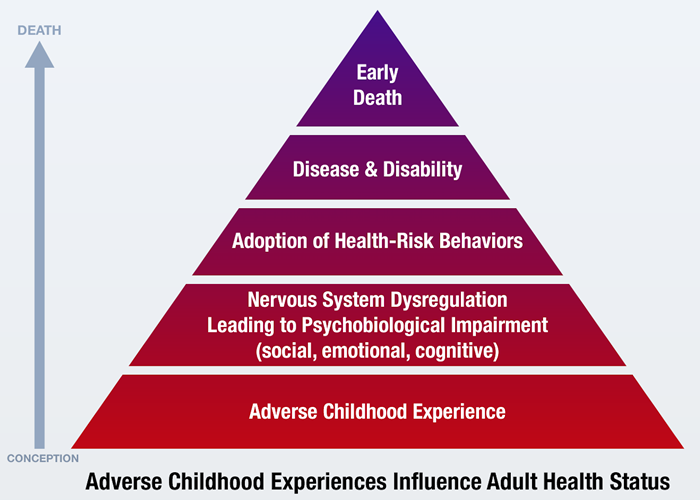 The ACEs Adverse Childhood experiences study is groundbreaking information. It can be seen as the link in integrated care, that is at the forefront right now in health clinics.This study has been incredibly important as it links long-term health issues (manifested decades later) to early life experiences. The research demonstrates a strong correlation between childhood adversity and specific diseases experienced in the adult population. In this way, it confirms how mental and physical health are intricately woven. The ACE study is 10 questions asking about early life experience from experiencing a loss of a parent to sexual abuse and everything in between. You can take it here. These are considered the “health risk behaviors” that are part of poor health and early death. This study underlined that the negative behaviors were connected to managing pain and finding comfort. This comfort and pain is directly linked to trauma-disrupted physiology in the nervous system. This disruption in the physiology can be eased by working in a body-oriented way that is focused on shifting the patterns of the nervous system.